I informed my insurers about my original installation and it was simply noted on the policy. I recently informed them about the forthcoming phase 2 and have received a load of questions from the underwriters so I think the industry must be starting to understand the risks and taking it a bit more seriously. what is the minimum space needed to leave from the gutter so the rain water doesn't miss the gutter ?? • To prevent rain running off the panels and over the guttering. • To prevent noise from wind flow around the array edge. • To avoid disturbance of cemented tiles at edge and ridge. Wont that depend on the pitch of the roof? Steep pitch faster run off = larger gap. depends on the height above the roof, strength of mounting structure, slope of roof, how windy the location is etc. essentially it is possible, but you'd generally need to lower the height of the panels above the roof, and increase the number of brackets used on the bottom row, and possibly add an extra rail in to the bottom panels to mitigate the impact of the increased wind loading. depending on the mounting system used you may also have to be quite careful about the choice of brackets to match with the tiles to get you the 20cm - ie with shuco systems using the bottom antislide clip below the panel there's not really any room to manouver the panel vertically once the rail's in position, so you need to look at where the roof fixing / rail / clip is actually going to locate the panel in relation to the tiles rather than just assuming that you can locate a panel 20cm from the bottom. Hi all, sorry to drag up this old chestnut. Does anyone know if the 3rd edition of the installation guide was ever published ?? And where can I download it ?? All I can find on the web is its coming, but it seems to have been coming for a long time. On my somewhat crammed 30 degree roof and 200 mm ish margin, it is snow that is the problem. It melts early on the black panels and slides down to form a "drift" at the bottom of each of three rows, This (re)frozen lump can break away as a near lethal avalanche and jump the bottom tiled margin of the roof. Fortunately I have a bungalow and have devised a telescopic brush for removing this snow before it slides to create a "drift". If you have kids or grandchildren take care. Its all well & good bringing out all these new "guidelines" but how do they plan on letting them people that need them? Just putting it on some obscure professionals web site wont let many people know. This is my first post and don't know if this is the best forum. 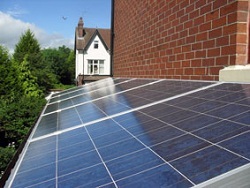 Earlier this year I had a PV system installed by a company that works throughout the UK. Although their installation diagram showed a DC Isolator switch between the panels and the inverter this was not fitted. I was not happy with this but they assured me that it was not necessary because there is a switch on the inverter. However, I was recently talking to local company about re-configuring the panels. They insist a separate DC Isolator should have been fitted before the system was approved. So I am confronted by two people each adamant that they are correct. Looking on this forum most of the posts on this issue are unclear. Personally, I want the switch but its a question of who pays. Could anybody give me clear advice? Hiya and welcome. Bit of a long shot, but does it happen to be a SolarEdge system? It's just that I understand that these don't need a DC isolator, though I may be wrong about that.